Good grief! I didn't realize that I haven't posted since March! 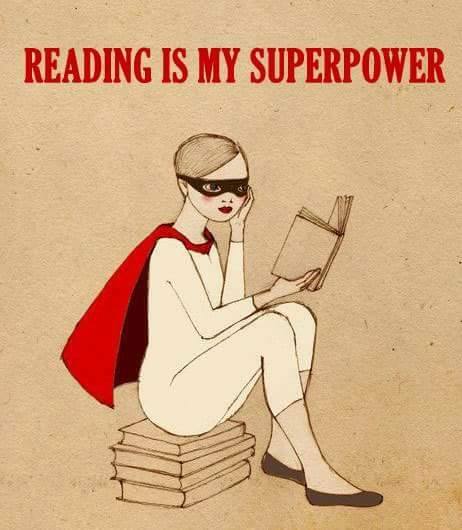 It's not that I haven't been reading because I have -- it's more that I'm reading a lot of books I've really liked in the last few months but finding myself with little time to talk about them. 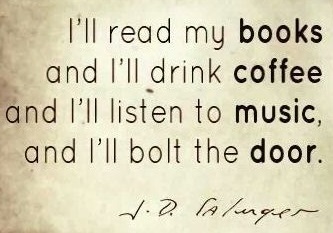 Today I do. 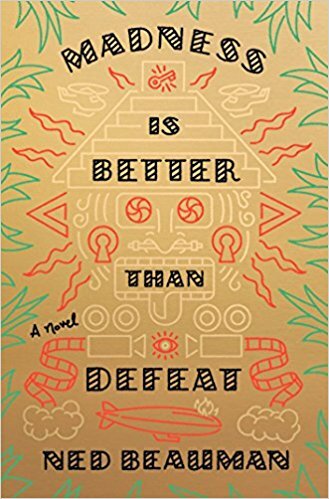 Up first is Ned Beauman's Madness is Better Than Defeat, which made me laugh out loud more than once. 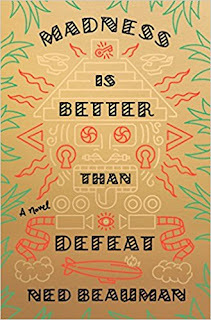 I was introduced to Ned Beauman's writing with his The Teleportation Accident, which also made me laugh out loud more than once, Madness is Better Than Defeat begins in 1938 and follows two different expeditions into the Honduran Jungle, both focused on a particular Mayan temple with a design very different from the norm. One of these has to do with the production of a movie, the other involves actually taking the temple apart and returning it to New York, where it will be reconstructed at the home of a wealthy and powerful businessman. A standoff ensues between the two sides when the movie people discover that the New York faction has already started demolishing the temple, but each side is determined to follow through with their tasks. As the decades go by and no one is sent in search of these people, they create their own society, which evolves through several forms over the years. If that's not weird enough, the arrival of the CIA in Honduras makes things even more hectic. 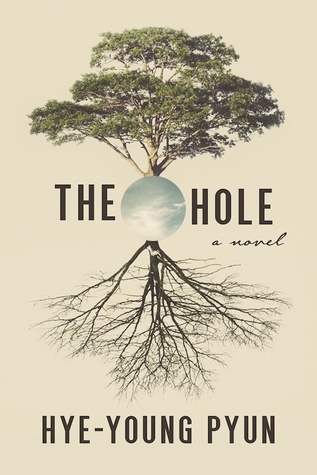 While we live in their world for a while, the narrator of this story, an OSS/CIA veteran who may or may not be under the influence of psychotropic spores has his own problems, busy day and night in an impossible search for evidence buried deep in a warehouse, which he hopes will exonerate him from charges stemming from his actions in Honduras. The author brings into his work a number of movie references, history, and philosophy before all is said and done; satire and allegory combine, especially when it comes to the CIA. It is crazy good, and highly recommended, especially for fans of Beauman's work. 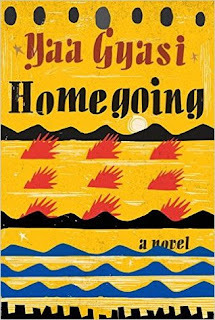 A real-world book group read, and a book on the very serious side, Homegoing follows two branches of one family from eighteenth-century Ghana on into the present. It begins with two sisters, born in two different villages, who each end up at Cape Coast Castle -- one as the wife of a white man from England who oversees slave trade operations, and the other, unbeknownst to her sister, a slave being held in the dungeon of the same castle awaiting transport. 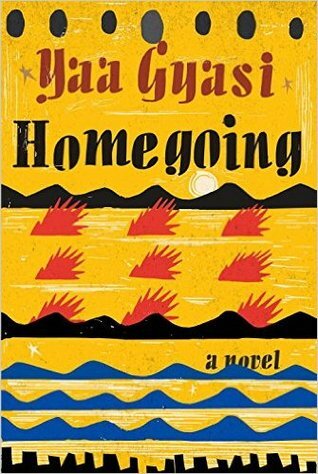 The story is divided between the descendants of both women, exploring a bit of Ghana's history as it pertained to the side of the family who remained in Africa, and taking readers through different points of American history to discuss the lives of those descended from slavery. In Ghana we live through the continuing tribal wars and conquests that lead to the capture of people who supply the slave ships, as well as colonization, while in America we go through slavery, the period of Jim Crow, the use of convict labor and the coal mines of Alabama, the migration north, and the hard existence of life in Harlem, where a black man's shade of color makes a world of difference. 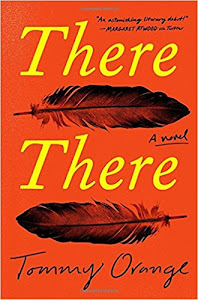 Very nicely done, a bit of a tear jerker, but I have to say that as much as I enjoyed this novel, the ending was much too predictable for me -- I saw it in my head long before we got there. Still, I definitely recommend it -- it's a brilliant piece of historical fiction. 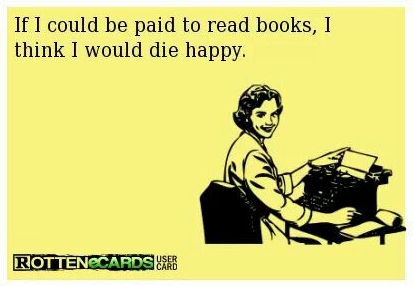 It was also a book that my IRL book group all enjoyed, which isn't always the case. "the world where, as his doctor explained, the only way to survive was through sheer force of will." He has no family he can call on to help him once he leaves the hospital; his friends and colleagues at the university where he works obviously have their own lives, so his mother-in-law takes it upon herself to take care of him. As it turns out, that probably was a bad idea, because while he lays, completely trapped in his own broken body, depending on his mother-in-law for his very survival, his mother-in-law is quietly making her way through secrets left behind by her daughter, who, as we begin to realize, was beyond unhappy in the marriage. While Oghi has plenty of time to contemplate his marriage, his mother-in-law begins to crack under the strain not only of her grief, but by being the caregiver to the person who she feels is responsible for her daughter's death. I've seen this book compared to Stephen King's Misery, but The Hole has much more weight and depth than King's book ever could. Some interesting points come up in exploring Oghi and his relationship to others, making you wonder if he is deserving more of sympathy or dislike. To tell more would be to spoil, and while not perfect, this is a dark page turner of a novel that I absolutely could not put down. It's one of those books where every time a page was turned I was afraid of what would happen next; I had to force myself NOT to turn to the ending more than once. I think this catches me up at least for now.